Every child's dream come true, Tokyo Joypolis will thrill and entertain children of all ages. Offering rides, games, and much more, kids will be kept busy for hours on end in one of the world's most famous theme parks and enjoy rides such as Geikon Live Coaster and games such as Halfpipe Tokyo, Let's Go Jungle, and The House of the Dead. There is also a 3D cinema, a caricature booth, and a stage for live entertainment. Apart from all the rides and games, there are several shops and a wide selection of restaurants to choose from (visitors should note that they can't take any food or beverages into the park with them). 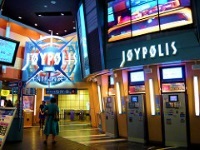 The park is lots of fun, even for adults, and its reputation is justified; however, although Joypolis once seemed almost futuristic, with groundbreaking forms of entertainment and gaming, the rest of the world has since caught up and things like 3D cinema are no longer as novel as they once were. Despite this, the park provides hours of entertainment for the whole family and is a wonderful attraction for a rainy day. The queues can get frustratingly long so it is best to go during the week, either early in the morning or in the evening. Admission: Adult: JPY 800. Children: JPY 500.